Following a shocking 53-43 defeat by the hands of Fordham in Kingston, it looks like it’s A-10 Tournament-or-bust for the Rhode Island Rams. What seemed like a 50-50 bubble team in Rhode Island is now going to need a miracle to get an at-large bid. A home loss to Dayton was a missed opportunity, and a home loss to Fordham is a head-scratcher to say the least. The Atlantic 10 is likely a 2 bid league this year, and while that’s not really a good thing for any team in the league, I guess you’ve got to smile a little bit if you’re a Fordham fan. Why should you smile? You played the role of the spoiler all season long, and even though you failed to beat Sacred Heart, Manhattan, or Duquesne, you took a lot of teams out of NCAA Tournament contention. Maybe I shouldn’t say that just yet, but you definitely knocked a few teams back a couple notches. 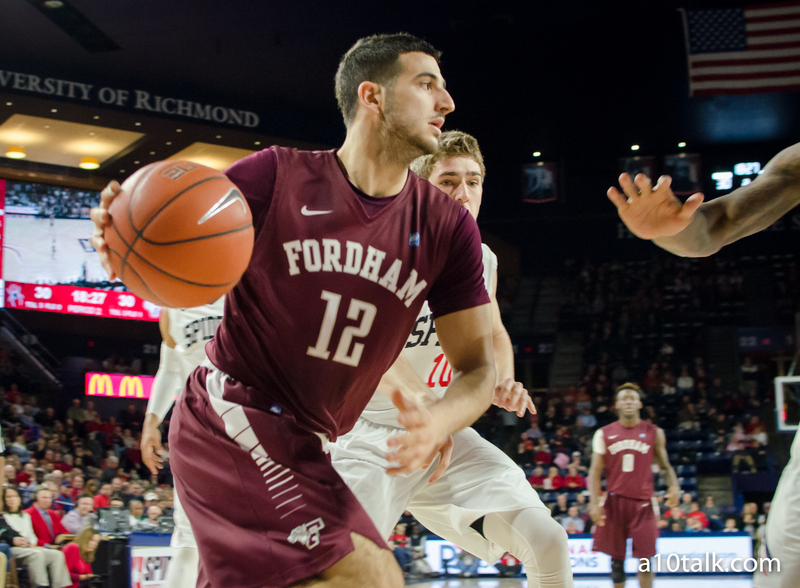 Fordham shot just 3-15 from long range on the road against Rhode Island. Should that be good enough to beat the Rams in Kingston? Absolutely not. But Rhode Island shot an abysmal 2-20 from deep and had its lowest scoring total since putting up 45 against Cleveland State in 2011. Yeah, it was an ugly game all-around. But nevertheless, give Fordham credit for spoiling Rhode Island’s season. The Rams had a horrible game, and Fordham did just enough to pull out one of the most surprising road wins of the season in the A-10. Javontae Hawkins led the Rams with 20 points (11 of which came from the charity stripe). Other than Hassan Martin with 15, no one scored more than 7 points for Rhode Island. 0.69 PPP for Rhode Island is quite something. As mentioned, this is not the first time Fordham’s put a team out of tournament contention. Davidson may have been a fringe tournament team before losing to Fordham at home. Sure, the Wildcats probably weren’t going to make the Big Dance anyway, but a loss to the Rams pretty much secured that assertion. Massachusetts’ season really took a turn for the worse after it lost at home to the Rams. The Minutemen have now lost 6 of their last 7, including a game against Saint Louis and a recent 30 (yes, 30!) point loss to Duquesne on the road. VCU also lost to Fordham, but that might be the only case where the loser didn’t get completely buried. After losing to Fordham, VCU was clearly headed in the wrong direction, but since, the Rams have won 7 in a row and look to be a virtual lock for this year’s NCAA Tournament. Though the Rams didn’t bury the other Rams (bear with me with all of these Rams), they certainly gave VCU a scare, and it’s yet another example of Fordham’s sneaky heroics. At 5-8, Fordham hasn’t been terrible in conference play, considering what was expected of this team. Javontae Hawkins has been an enormous part of Fordham’s surprising success this season. Leading the way with 20 points against Rhode Island, Hawkins was a huge piece to pulling one of the craziest upsets of Atlantic 10 play. He had 22 against VCU and 18 against Massachusetts. Hawkins also showed up with 17 against Davidson. Though Fordham probably doesn’t have any postseason plans, you’ve gotta think this team is having fun. Let’s just say I wouldn’t want to face the Rams in Pittsburgh, especially if you’re playing for a tourney bid.